Remnants of Wall Arch on August 6, 2008, two days after the collapse. Blocks occasionally fell from the remaining “arms” for a few days after the collapse, but none are known to have fallen since. Photo by Rich Giraud, UGS. 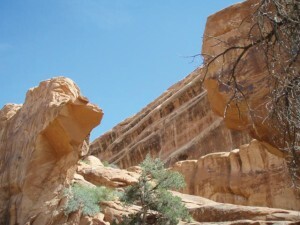 Wall Arch was classified as a “fin natural arch” (Natural Arch and Bridge Society definition) that was carved into a rib or fin of the Slick Rock Member of the Entrada Sandstone. Though not a particularly long span, Wall Arch appeared to be precariously supported – note in the “before” photograph that the central part of the arch lacked a sturdy arch shape, but rather seemed to have a bow or sag. The first sign of trouble occurred in 1969 when a large slab of rock fell from the underside of the south lintel. In 2007, I remember looking up at the span and saying to my son, “There sure doesn’t seem to be much holding that arch up” – evidently there was not. Fortunately, Wall Arch collapsed at night when no one was near – that very day many people had scrambled around under the arch much of the time. Probably, nighttime cooling-induced contraction following a day in the hot sun was the final straw that caused the fall. The Devils Garden loop trail remains open. The collapse area is currently roped off because open fractures suggest that large blocks on the arch remnants are still unstable, but the trail has been rerouted close enough to see the fallen arch debris. 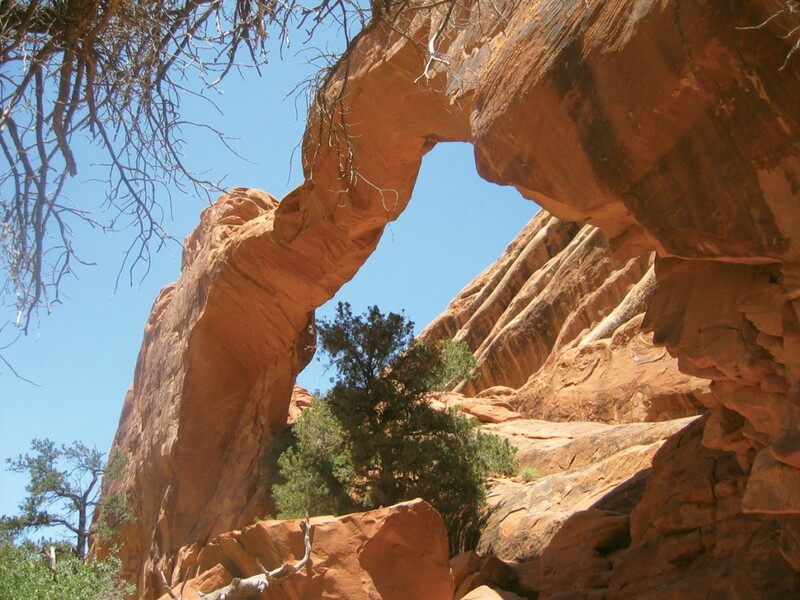 And while you are there, be sure to stop and admire Landscape Arch, which at 290 feet has the longest span in the world. Landscape is also near the end of its life; who knows how long we will be allowed to admire this gravity-defying natural wonder? Enter Arches National Park about 3 miles north of Moab on U.S. Highway 191. Proceed through the entrance station (fee required) and follow the paved road 16.7 miles northeast through the park to Devils Garden Trailhead (the branch road at 11.7 miles goes to Delicate Arch). On popular summer, holiday, and weekend days, the Devils Garden Trailhead parking lot fills up, though cars come and go frequently, so you can usually find a parking place if you are patient. Walk the easy, well-signed sand and gravel trail about 0.8 mile to see collapsed remnants of Wall Arch just a few hundred feet beyond Landscape Arch. Thanks to Tim Connors and Paul Henderson (NPS) and Jay Wilbur (NABS) who contributed information for this article.